The system will ship with 500 GB of memory, 8 GB of RAM and a built-in Blu-ray drive. 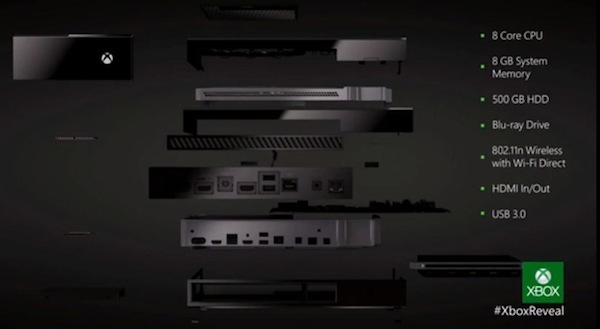 Xbox One will feature an 8 Core CPU, USB 3.0 ports, WiFi Direct to connect to the system’s new controller and other devices and HDMI outputs. Xbox One will feature five billion transistors – comparatively, an average AMD chip has 1.4 billion. Xbox One will also have three operating systems; the Xbox OS, a Windows kernel OS (for Web-powered apps and experiences) and a third OS which connects the other two for easy integration. The presentation featured some information on the new controller, as well, which features “over 40 design innovations,” including an integrated battery compartment, dynamic triggers and a newly designed D-pad. The system was built with SmartGlass in mind, as well, and will better incorporate the app into the system. Additionally, the new Kinect sensor is “the binding power between these devices,” reading almost every device that connects to the Xbox One, including the controller.